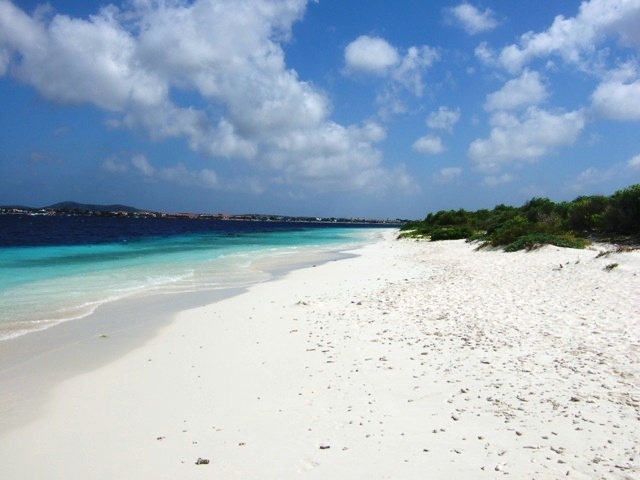 Klein Bonaire is a small deserted island opposite the capital Kralendijk and about 0.7 miles by dinghy. 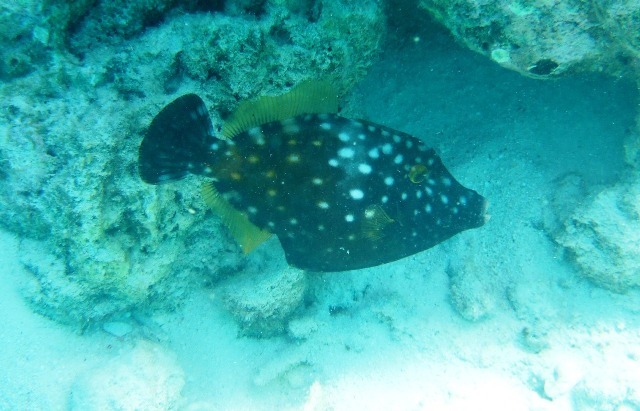 It is very flat and covered in scrub, but has dive/snorkeling sites all round it. We made the trip across twice. The wind was behind us when going which of course meant we were bashing into it on the way back, so just as well that we had wetsuits on as being quite small, the dinghy ships a lot of water when going into a big chop.There is a water taxi across, but at £10pp we went on our own. Possibly for that reason there are never many people over there. 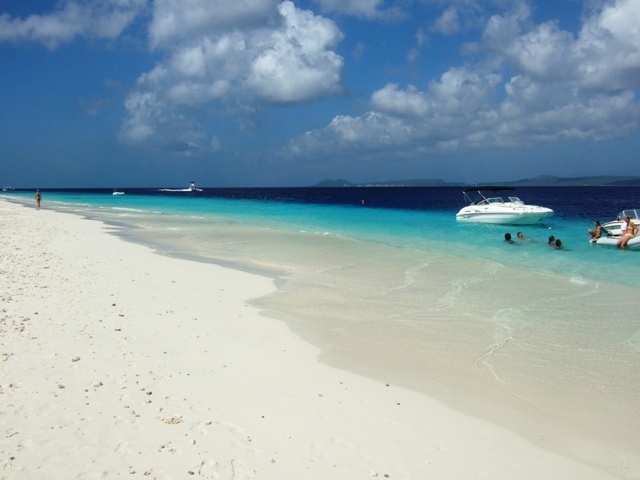 The main beach on Klein Bonaire, looking north west. The same beach looking the other way, with the mainland on the left. 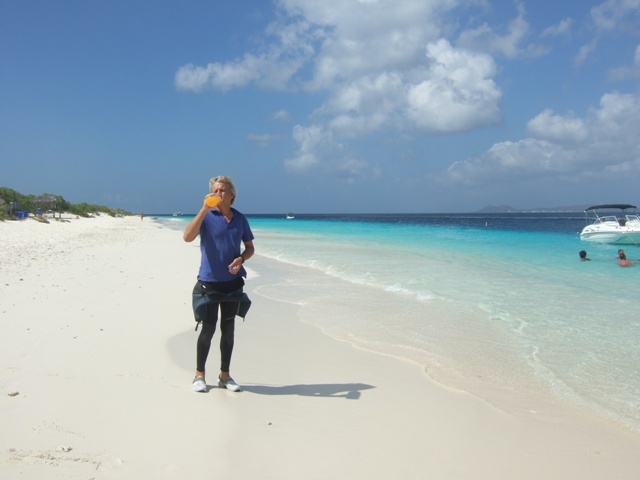 Wetsuit rolled down to the waist and coral shoes on - didn't want to step on something sharp or with teeth! Over the edge! - the seabed literally goes over a cliff down into very deep water. 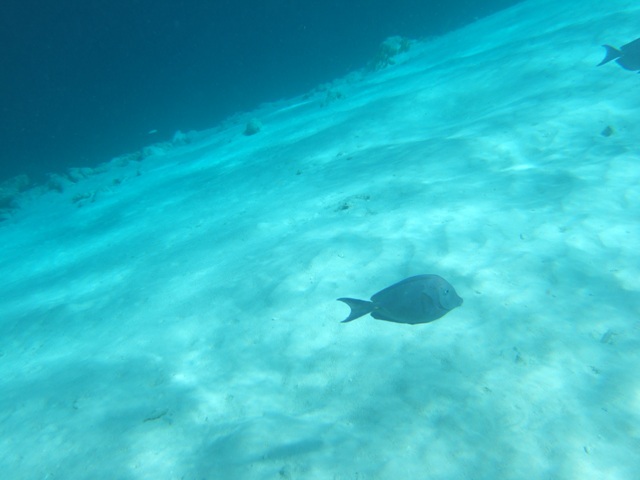 The coast all round Bonaire has a narrow shelf and then plummets into the deep. It makes for good snorkeling when over the edge. 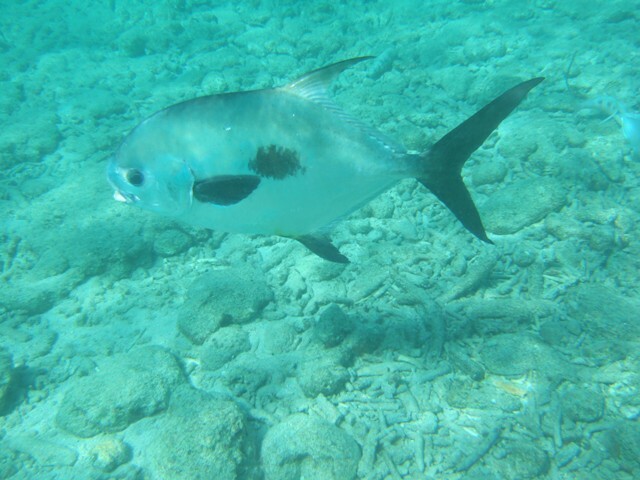 You can look out into the deep for big fish and turtles, and back to the shallows for the common reef fish. 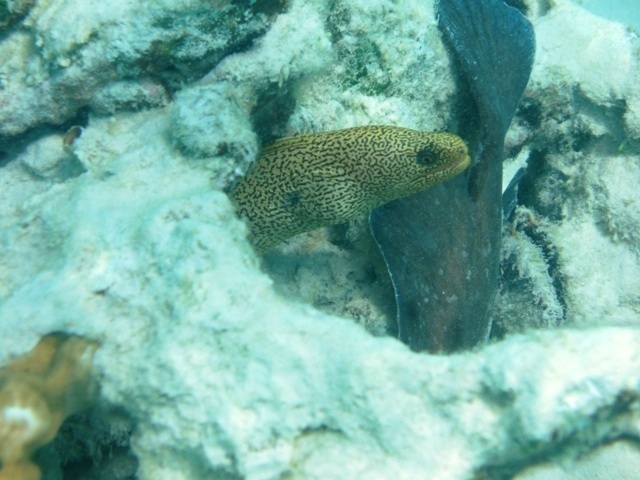 A small Yellow Spotted moray eel with a Soapfish wrapped around the rock. Fish a bit closer home - Sergeant Majors under the boat. 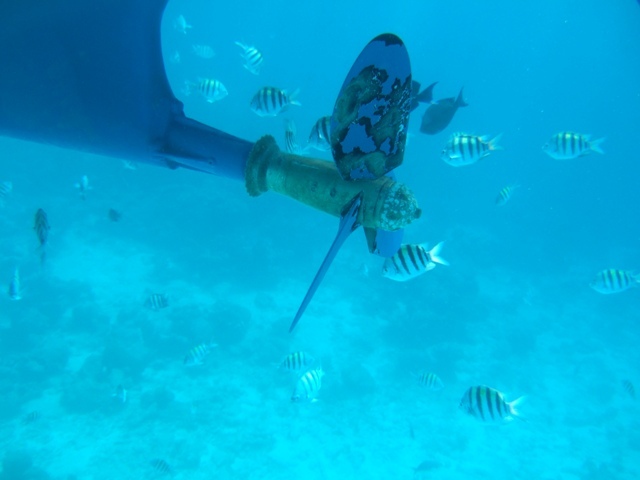 My attempts at antifouling the propeller haven't been too successful. A primer, 2 coats of hard antifouling and 2 coats of soft antifouling are all starting to come off after just a month in the water. A Palmeto in the shallows - it's bigger than it looks at about 2ft long. The New Year here definitely came in with a bang! It's our Bonfire night and New Year all rolled into one. Fireworks were being let off from Boxing Day, but on New Year's eve they were being let off every few minutes from 6pm onwards and at midnight there were fireworks going off in all directions. All the hotels, the bars and individuals, all completely uncoordinated and it went on for an hour and a half non-stop. We've seen better fireworks, but never sustained for this long and the noise was deafening - we could have been in a war zone for 90 minutes!. They included Chinese-type fire crackers that were 20 yards or more long and the biggest bangers we have ever heard - more like mortar shells! We finally got to bed at 02.30. Much to our amazement our spare fridge controller has arrived, in Panama..It came from Annapolis in the States and we had the choice of getting it sent here, and probably having to wait for it, or getting it sent to a marina in Panama. We chose the Panama option as the marina there said they would hold it until we arrived. So it was ordered on the Monday after Christmas and much to our surprise it arrived at the marina in Panama on New Year's Eve. Some friends who have already reached Panama have already picked it up and will hold on to it until we see them again in February.